4 vets on a pheasant hunt south of Denver. A reporter came along too & here is a link to the story. USWO SPONSORS TWO AMERICAN HEROES FOR THE TIM THIES MEMORIAL TURKEY HUNT IN NEBRASKA!! In honor of our friend and USWO Director, Tim Thies, (who passed away only a few days after our inaugural turkey hunt in 2013, USWO sponsored two of Americas Heroes for its second annual Nebraska turkey hunt. The weekend of April 12, 204 USWO brought out Roger Burwell(Army - Colorado Springs, CO ) and Les Keator (Army - Pueblo, CO ) on an awesome turkey hunt to Lewellen, Nebraska. Both hunters were on their first ever turkey hunt and each harvested a bird!! As a matter of fact, Roger filled both his tags. Guided by USWO Nebraska Programs Director, Bill Dorris, both veterans had their birds down by 10am opening day – not bad for an old guy guide who is also a wounded veteran. The weather changed dramatically Saturday afternoon with gale force winds, snow overnight and frigid temperatures so the hunt was over but with many successes. Great to hang out with Roger and Les, as well as Les’s wife Marti for a few days for some great hunting, eating and good laughs. Special thanks to both veterans for your service to our country. • Tim Thies – a special brother of USWO and friend, but also a father and husband to both Tyler and Dawn Thies of Arvada, CO. Tim had a passion for USWO, our veterans and the outdoors. Tim passed away on April 12, 2013 just a few days after our inaugural Nebraska turkey hunt. We miss you buddy! March 8th was the 1ST ANNUAL USWO POKER FUNDRAISER held at American Legion Post #161 in Arvada Colorado. The event was organized by the Jonke brothers and was their 12th annual event. The Jonke brothers, Aaron and Ryan, organize this event to help raise money for Hearts of Fire, a Denver Fireman’s charity. This year USWO had the privilege of partnering with them for what turned out to be a fantastic day. There were tons of door prizes but in addition to that USWO was proud to offer several silent auction items. A world class walleye fishing trip during the spawn for two to Lake McConaughy, Nebraska for 3 days including guiding, lodging and meals, and Nebraska turkey hunt for one person, guiding, lodging, and meals all provided on private property. Both of the Nebraska events will be staged from Clear Creek Retreat hosted by Punch and Kathy Edwards. Hold on! That's not all... USWO had a Bushmaster AR from 5280 Armory that was its own special raffle item. What a fantastic day of hunting for geese on Wednesday, February 12, 2014. USWO and Birds of Fall Outfitters (Windsor, CO), hosted three wounded veterans for a day of goose hunting, with world class goose guide and caller Steve Lutz in Windsor, Colorado. Steve’s well-respected Birds of Fall Outfitters provided guiding services and an amazingly comfortable hunting blind including heat!! Steve put out about 500 decoys bordering a pond with open water and we had tons of groups of geese flying most of the morning. The three veterans and Jake Schroeder were all hunting and bagged their limit by lunch with a little help from Harley, Steve’s black lab retriever!! “USWO provides a great outdoor experience for everyone involved including logistics, quality hunting environment and their devout care for our veterans”, said Jake Schroeder, Opie Gone Bad singer and staunch supporter of veterans. “USWO put on a safe, relaxing and awesome hunt for these guys. I spent a few hours trading stories with the guys, between shooting geese, and developing a better understanding of their experiences and stresses from their combat deployments. These guys are our heroes and we all need to step up, in some way, to help, support and thank these men and women for preserving our freedoms and safety. Thank you USWO for the great work you do”. Caleb Patton (Marine), North Carolina; Carl Sturgeon (Air Force) Colorado, James Swensen (Marine) Colorado came out with us for the day and had a blast. “I have not been out hunting for several years”, said Swensen, “USWO provided an amazingly dynamic situation, safe and full of action. I never imagined we would see so many birds and get as many laughs as we did throughout the day – thank you US Warriors Outdoors”. Caleb Patton grew up hunting in Missouri with his father but due to his multiple combat deployments and subsequent injuries has not been able to get back into the field. According to Caleb: “This day with USWO brought back many fond memories of growing up hunting with my father, the values he taught me and the great times we shared. I am grateful to USWO for providing this opportunity for me”. Everyone shot their limit, a total of 20 birds! Weather was awesome and we probably had 30 different groups of birds, from singles to larger groups, approach our blind and spread. “Steve Lutz is an awesome guy. Dedicated supporter of our military and generously donated this hunt for our three wounded heroes”, said Gene Palumbo, President of USWO, “Not only did Steve donate this hunt to us but he also arranged free taxidermy services for three goose mounts through a friend of his, Thomas Picklesimer”. Thomas is a Marine Corps veteran and owner of High Plains Taxidermy Studio, in Wellington, Colorado. “I am honored to give back to my brothers in arms”, said Thomas. “Providing goose mounts for these three warriors is my way of saying thank you to each of them”. USWO hits 1000 Facebook LIKES!!! WOOT WOOT!!! Big thanks to EVERYONE who has helped support USWO and spread the word. Additional thanks to Kevin Cline for being the 1000th like! Karl Mecklenburg, former Denver Bronco All-Pro linebacker, Karl’s 15 year old son and Pheasants Forever partners with USWO and sponsors a wounded veteran hunt in Northern Nebraska for 3 wounded veterans. According to Karl’s experience with us: "Last weekend’s hunting event with US Warriors Outdoors brought together my passion for hunting and my respect and admiration for those who have served our country in the armed services. USWO provides a therapeutic, safe and fun outdoor experience for our veteran heroes in quality environments." What a great weekend of hunting in Dalton, Nebraska at the Prairie Springs Ranch at the end of October. All veterans shot birds, ate well and slept well at the ranch hosted by Bryan and Theresa Reimers. Special thanks to Bryan and Theresa for their generous support of our wounded heroes. Everyone arrived Saturday afternoon and shot some clays to warm up for our Sunday morning pheasant hunt. Mother Nature was very cooperative, no wind and plenty of sunshine for a great day of bird hunting hunting in Nebraska . "We were honored to provide a great weekend of hunting for our American Heroes: Paul Tebedo (Colorado - Operation Iraqi Freedom - Marine), Jason Nickels (Nebraska – Operation Iraqi Freedom – Army)", Bill Dorris – (Nebraska - Vietnam – Army) said Gene Palumbo, President of US Warriors Outdoors. "Having Karl Mecklenburg and his son along with us added a special validation about what USWO does as an organization and nice connection with our wounded veterans". d), of North Platte, Nebraska attended this weekend event and each harvested two turkeys! The hunting team had many turkey sightings and opportunities and both Mike and John had both of their tags filled within the first few hours of the hunt. Jenny Nguyen, Public Information Officer for Nebraska Game and Parks participated in the hunt as well and she shot her very first turkey! She had several opportunities to fill her second tag but apparently her shotgun was not shooting straight! Congratulations to Mike, John and Jenny. Talk about big smiles and great stories!! Jenny attended this hunt to get a feel for what types of events USWO provides. She had the opportunity to spend the weekend with our team and wounded veterans, conducted interviews and took great pictures in the spirit of writing a story about USWO and publishing it in Nebraskaland Magazine. USWO appreciates the continuing support from Nebraska Game and Parks and special thanks to Jenny for coming out and supporting us. Also, special thanks to Punch and Cathy Williams for providing lodging at Clear Creek Retreat. USWO just returned from a Fall turkey hunt in Lewellen, Nebraska and had tons of turkey action!! Wounded veterans, Mike Cini, of Castle Rock, Colorado and John Plank (pictured), of North Platte, Nebraska attended this weekend event and each harvested two turkeys! Mike Cini is a Vietnam veteran who lost his leg in combat and John Plank is a 100% disabled Army Operation Iraqi Freedom combat veteran. Thank you veteran heroes!! The hunting team had many turkey sightings and opportunities and both Mike and John had both of their tags filled within the first few hours of the hunt. According to Mike "USWO has given me a new breadth of life by helping me get back to the outdoors and reconnecting with things I used to enjoy but thought I could never experience again. They provided excellent property to hunt, quality volunteers and the opportunity to experience this hunt with another wounded veteran I could relate to and share stories with. I am forever grateful for their friendship and generosity". USWO hosted 3 wounded veterans for an elk hunt near Walden, CO.
All 3 veterans had incredible elk hunting action. One veteran, Roger Burwell from Colorado Springs, CO., missed an elk at 122 yards! Roger said he was shaking so badly with about 35 elk in front of him and when it was time to shoot he just couldn’t place the shot!! The missed shot happened after watching some rutting bulls bugle and chase cows and each other around for about 90 minutes right in from of us – anywhere from 30 – 125 yards away…very exciting elk action. Roger also had a potential shot opening night but by the time we got within 300 yards of the cow it was past legal shooting light. Steve Holloway, wounded warrior from Wellington, Florida, drove 40 hours from Florida to Northern Colorado through massive construction zones in multiple states, inclimate weather and with sheer determination to get out on his first hunt in over 10 years. Steve is a wheelchair bound veteran and was injured by a sniper in Iraq in 2007. Steve took this journey from Florida with his father Ken, from Alliance, Nebraska, who participated in his sons hunting adventure. Ken had built up a very nice Winchester Model 70 .338 Win Mag with a 4x14 Leupold scope for Steve to hunt with. The first evening Steve went out to hunt, we set him up in a ground blind along a hayfield at the base of a mountain covered with Aspens and dark timber. During the past several days, we had seen several elk traveling up and down this mountain and thought it would be a great spot for Steve. With about 2 minutes of shooting light left in the day, our guide called in a cow elk that ran right towards the bull call. The cow stopped facing us at about 92 yards! The guide whispered to Steve to shoot when ready, Steve took a deep breath and fired. That .338 dropped the cow like a lead balloon and we all cheered with joy! Very exciting for all. Les Keator, a 100% disabled wounded warrior, from Pueblo, Colorado also had some great action but he had very limited time to hunt. His opening night, we called in about 40 elk within 450 yards but could not get them to come any closer. Watching the herd dynamics, listening to the bulls bugle and in such a quintessential setting was an incredible experience. Les and his lovely wife Marti were also volunteers for the hunt!! A very special thank you both for making this whole trip even more exciting and comfortable for everyone. Les and Marti basically brought elk camp in a trailer and set it up. We had three wall tents, sheepherders stoves, comfortable beds and gourmet food all prepared by Marti. We ate like kings, slept comfortably and had many hours of great laughs and stories. Thanks again to Les and Marti for their monumental help. Special thanks to our 3 wounded veterans, Steve Holloway, Les Keator and Roger Burwell, we are honored to have you in the field with us. Thanks to Cabela’s for donating some hunters orange vests and hats for our 3 wounded hero hunters as well as a large cot for one or our veterans to use on his trip in one of our army surplus tents. Nebraska Game and Parks renovates and donates handicapped accessible duck/goose blind to USWO. In an unprecedented move NG&P works with USWO to create access to quality duck and goose hunting for our USWO American Heroes! USWO helped them add an addition to the blind including a wheelchair accessible ramp, heat and a two burner propane stove. "We are honored to have Ryan Meyer join our USWO team. said USWO President, Gene Palumbo. "Ryan has great experience in guiding people with disabilities on hunting, fishing and outdoor adventures. In addition to his dedication and background with helping people, Ryan brings great marketing, public relations and relationship building skills and will develop our Missouri Chapter." Ryan Meyer is from Omaha, Nebraska and has enjoyed hunting, fishing, and the outdoors since he was very young. As an avid hunter, he enjoys all types of hunting from upland bird hunting to all facets of bow hunting and big game hunting. His true passion and call is fulfilled by guiding and providing youths and people with disabilities the opportunity to enjoy hunting and fishing opportunities in the outdoors. Ryan is currently in his second year in graduate school pursuing his Master’s in Business Administration at Northwest Missouri State University in Maryville, Missouri. Ryan completed his undergraduate degree in Business Marketing and Management at Northwest Missouri State University while playing defensive tackle for the Northwest’s Football team for 5 years achieving 2 Conference Championships and 1 National Championship in NCAA Division II. With experience in Change Management and Organization Transformation at Cabela’s World Headquarters in Sidney, Nebraska, Customer Sales Representative experience with American Family Insurance, leadership in Fellowship of Christian Athletes, and leadership in collegiate athletic participation, Ryan is geared for helping and serving others by handling and assisting in coordination, public relations, marketing, and fundraising efforts for different events and functions of U.S. Warriors Outdoors. USWO ADDS NEW REGIONAL DIRECTOR TO TEAM!!! "We are honored to have Dave Proffit join our team here in Colorado" said USWO President, Gene Palumbo. "Dave brings incredible background in fundraising, relationships, business management, event planning and strategic partner abilities as well as his deep respect for our veterans and outdoor adventure". Dave grew up hunting and fishing in Minnesota. He moved to Colorado in 1983 and added elk hunting to his list of outdoor activities. In 1989, Dave got involved in fundraising for elk, other wildlife and their habitat including organizations like the Rocky Mountain Elk Foundation. For more than 20 years, Dave has been involved in fundraising to support wildlife conservation and the shooting sports. In 2010, Dave left Colorado to spend a year in Iraq as a DOD Contractor. During his year in Iraq, Dave lived on 3 different military bases and worked with the brave men and women of the US Military everyday. Dave spent hours talking with soldiers about hunting and fishing back home. With a passion for the outdoors and a strong appreciation for the US Military, Dave found a perfect match in the US Warriors Outdoors. At the end of August, USWO was invited to participate in the two new Cabelas store openings in both Thornton and Lone Tree, Colorado. Two days of store opening chaos. USWO had a tent set up and we had the opportunity to meet many new potential volunteers, wounded veterans and land owners willing to donate their private properties for future hunts. Thanks Cabelas! USWO Participates in Cabela's, Sidney, Nebraska, Fall Great Outdoor Days. Saturday and Sunday, August 24th and 25th, USWO had a tent set up at the store entrance. Cabela's invited us to set up to help build visibility for USWO and further establish USWO as a viable and important partner!! "We made many new friends and contacts for business relationships, potential veteran hunters, volunteers, as well as land owners interested in donating hunts for wounded warriors", said Bill Dorris, USWO Nebraska Programs Director. "Cabela's stepped up again to show their support for the great things we do for our wounded warriors and youth". USWO ADDS NEW BOARD OF ADVISORS MEMBER TO TEAM!!! "We are honored to have Brandon Sewall join our team here in Colorado" said USWO President, Gene Palumbo. "Brandon is a 9 year Air Force veteran, tenured Lockheed Martin professional and brings a solid understanding of military service, excellent background in business strategy, business management and technology that will help evolve US Warriors Outdoors and its services for wounded veterans. Brandon is a lifetime outdoorsman and has a keen appreciation of the therapeutic benefits outdoor adventures brings to veterans. We are honored to have Brandon join the Board". Brandon Sewall was a military brat and a military member so he moved around a lot, but home is where the heart is and his heart is in the mountains of Colorado. Brandon is an avid hiker and has conquered several of Colorado’s 14er mountains. He also enjoys hunting, both archery and long rifle, as well as fishing, camping, mountain biking, and basically anything that has to do with the Colorado outdoors. As a jack of all trades, Brandon also is a musician, enjoys wood working, firearms and archery marksmanship, and emergency preparedness training. Brandon served as an Airman in the United States Air Force from 1996 to 2005 and continues to support the war fighter through his work with defense contractor Lockheed Martin. While working at Lockheed Martin Brandon completed both his undergraduate degree in Information Security as well as his Master’s degree in Information System Security Management. Brandon maintains multiple professional certifications through Microsoft as a Certified Systems Administrator and through the International Information Systems Security Certification Consortium as a Certified Information Systems Security Professional. Brandon’s love of the outdoors and his family’s history of military service have kindled the flame for helping our nations wounded veterans to participate in those same outdoor adventures that he enjoys. For Brandon, partnering with U.S. Warriors Outdoors was a no brainer and has repeatedly stated that he is "all in". U.S. Warriors Outdoors featured in local Colorado newspaper!! Nebraska Walleye fishing and parasailing adventure for wounded veteran, Mike Cini. USWO took Mike to Lake McConaughy where he caught lots of fish and USWO surprised him with a parasail on the lake! 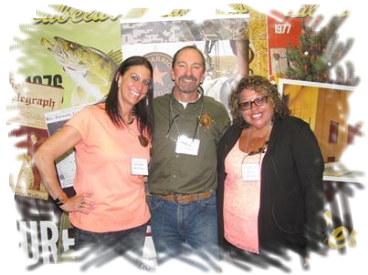 USWO members, Gene Palumbo and Jennifer Reifman were invited to attend the 2013 Cabela's shareholders meeting this past Tuesday and Wednesday, June 4th and 5th. “What a great honor to get invited to this event and to have the opportunity to meet many Cabela's constituents, new key people and continue to build excellent relationships with our sponsor”, said Gene. “We were able to lock down several co-branded program strategies enabling us to continue to leverage the powerful Cabela's brand and stamp of approval they have extended to USWO”. The event kicked off on Tuesday night at a small concert venue, the Sidney fairgrounds, for employees and shareholders, and featured Luke Bryan, Cabela's new spokesperson. Country rocker John Pardi opened for Luke. DR. CHUCK STECKER JOINS US WARRIORS OUTDOORS AS ADVISORY BOARD MEMBER. "US Warriors Outdoors is providing a desperately needed service not just to our "Wounded Warriors" but also to their families and our nation. As a result of their dedication and passion, warriors are being given the opportunity for healing beyond anything our hospitals could do for them. It is an honor and a privilege to serve with US Warriors Outdoors". Dr. Stecker brings an enormous amount of military experience, non-profit background, business acumen and Christian leadership to USWO. "I am flattered and honored to have Chuck join our fine organization in a consultative and leadership capacity", said Gene Palumbo, President of USWO, "Chuck's pure commitment to people, veterans and families is a perfect for the USWO mission and goals". Rev. Chuck Stecker is the President and Founder of A Chosen Generation. Chuck is an ordained minister of the Gospel with the Evangelical Church Alliance and has earned a Doctorate of Ministry and Ph.D. in Communications specializing in Christian Leadership. As an Army Lieutenant Colonel, Chuck served in various key leadership and staff positions, including 3 years on the Joint Staff in the Pentagon. After his retirement, he served with Promise Keepers for three years as the Regional Director. In 1997, Chuck launched a ministry which became A Chosen Generation. Chuck uniquely combines several years of business experience, 23 years of military service and nearly 20 years of vocational ministry to bring forth a clear strategy to equip and train a new generation of leaders. His passion is to see churches return to truly intergenerational communities and develop the clear pathways that keep young adults actively connected to their churches and see them develop into the leaders that will impact every area of our society. His clear vision and leadership teachings have impacted churches, schools, the military and businesses all over the country and as well as other nations. He is able to boldly challenge men and women of all ages to develop strong moral character and give them principles that they can apply to their lives to become spiritually mature and responsible adults. Chuck has spoken to audiences across the nation and around the world on various subjects including Strategies for Intergenerational Ministry Developing, Becoming Strategic Leaders, Rites of Passage, Mentoring/Coaching, Ministry to Men as well as Character and Integrity Issues. Chuck has written a book for parents and leaders about Rites of Passage entitled Men of Honor & Women of Virtue, The Power of Rites of Passage. In addition, Chuck has authored several articles and is a contributing author to Effective Men’s Ministry: The Indispensable Toolkit for Your Church. He is an Associate Professor for Intergenerational Leadership at Louisiana Baptist University and Theological Seminary and serves as an advisor/consultant at Continental Theological Seminary near Brussels, Belgium. In addition to serving on the Board of Directors of CSB Ministries, Chuck also serves on the Advisory Boards of US Warriors Outdoors and the National Coalition of Ministries to Men. Chuck has served the Lord in the local church in various ministry and leadership positions. Chuck and his wife Billie make their home in Littleton, Colorado and are a vital part of their home church, Grace Community Church. They have three grown children, three incredible granddaughters and a grandson. To all USWO friends. It is with great sorrow I must share news regarding the passing of my dear friend and USWO partner, Tim Thies. Friends and family gathered yesterday, Tuesday, April 30, 2013 to honor Tim at a memorial service in Arvada, Colorado after Tim passed suddenly last Tuesday, April 24, 2013. Tim and I have poured our blood, sweat and tears into this fine organization with the sole purpose of unselfishly giving back to our wounded warrior heroes. Tim’s enthusiasm for our mission mimicked an 8 year old child’s innocent excitement on Christmas morning. This excitement, and infectious enthusiasm, was the core of our very existence and helped drive our ability to build excellent relationships with partners and wounded veterans. Everyone Tim touched, immediately loved the man. Tim is irreplaceable. But in honor of our mission, and in Tim’s words I can clearly hear this morning: “Hey Gene, our mission to help others and re-instill hope and confidence with our veteran heroes must never change and I will always be helping. Use me as your burning light for US Warriors Outdoors and its continued growth and success”. Of course, Tim would never want the team of volunteers to miss a step as we continue to grow and get more veterans into the field. So, in your honor Tim, we won’t miss a step and you will be our catalyst for hope, inspiration and a shining star for us to follow. You will be dearly missed by many Tim. We love you, man! "Join me in welcoming Courtney Stecker to our Board of Trustees at USWO! An exciting day for us as we continue to evolve and build a credible team of dedicated, motivated and caring people purposed with helping our service men and women," said USWO president and founder Gene Palumbo. U.S. Warriors Outdoors (USWO) president and founder Gene Palumbo announced today that Courtney Stecker, Iraq veteran who served with numerous different units finishing with the 175th Infantry, Maryland National Guard, has joined USWO as the newest member of our Board of Trustees. Stecker, is currently matriculating at Georgetown University where his studies focus on international relations, and national security. Courtney Stecker served almost nine years in the U.S. Army. He has been an active member in veteran circles working with Espirit de Corps on the documentary film Veteran Nation, Vets for Freedom, The Iraq Society, and Wounded Warrior events and fundraisers. Stecker, son of a retired Army Lieutenant Colonel, is also familiar with the service and sacrifice that military families make and the importance of organizations like USWO to re-forging family ties after deployments. Cabela's becomes an official sponsor for U.S. Warriors Outdoors. Our first hunt for two wounded veterans. Wounded Veteran turkey hunt on April 20, 2013 in Lewellen, Nebraska. What a weekend, two nights of lodging provided by Clear Creek Retreat, guiding services for 2 days of hunting provided by Bill Doris and reception dinner donated by Otter Creek Lodge. What incredible local support for our wounded heroes. What could be better than this - supporting the people that unselfishly sacrifice themselves for you and I. Bob Coker added to Board of Directors. Bob is an icon in the hunting world. One of his claims to fame is his stellar reputation in the world of TV hunting show production with TV stations such as the Pursuit Channel, Versus and Comcast Sports South. Bob also owns and runs the Birmingham Deer EXPO, the largest consumer hunting show in the country. His absolute commitment to the sport of hunting, respect for our armed forces as well as his contacts throughout the hunting world including athletes, celebrities and hunting product manufacturers, is a huge benefit for US Warriors Outdoors. Bob will film some of the USWO hunts with our wounded heroes and broadcast them on his television networks. Per Bob "I am honored to support this excellent organization and provide resources and ideas to get our wounded veterans into the field and create great experiences". US Warriors Outdoors received IRS 501(c)3 approval!! 501(c)3 approval is a huge success as it will allow us to build strong relationships with private donors, corporate sponsors and others who will receive tax benefits through their support of USWO. This approval enables us to actively solicit financial support as well as continuing to build our network of outfitters and guides interested in providing their ranches and lodges for quality hunts. U.S. Warriors Outdoors Launches - providing hunting adventures on quality private properties for our wounded veteran brothers and sisters in arms!! "I am honored to give back to our heroes and provide excellent outdoor adventures for wounded veterans" said Gene Palumbo, Founder or USWO. "So many of our wounded veterans come back home to a changed life and limited resources. We are providing the resources and means for these heroes to get back into the outdoors, reconnect with their passions and re-instill hope and optimism in their lives. "We need all the help we can get financially to get our heroes back into the outdoors. We accept donations on our website through PayPal".